The ELAN 45 Impression is an excellent sailboat for your next sailing holiday in Croatia. Featuring 4 cabins and accommodating 9 guests, the ELAN 45 Impression is both inviting and classy. 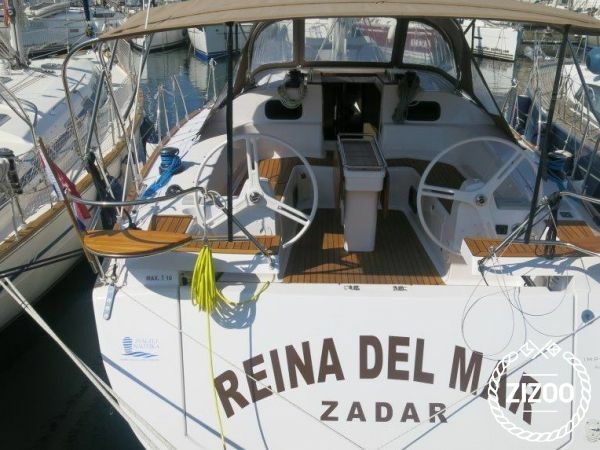 This boat is perfect for a quiet retreat with the kids or a corporate vacation, making it the ideal boat to set sail in and for cruising from beach to beach and cove to harbour in Zadar Marina (Zadar). The ELAN 45 Impression is located in Zadar Marina (Zadar) is a splendid sailboat, built in 2015, making it a sensational option for discovering the beauty of Zadar. Stop dreaming and start booking now!. Impression 45 is in every way an impressive sailing yacht. Developed to satisfy the needs of all family members, it will be a joy for cruising vacations. Every detail ensures an enjoyable and safe journey, from the spacious open cockpit with its large seating area all around the cockpit table, to the wide passage way forward where plenty of space for sunbathing awaits. Twin wheels offer excellent steering positions for the helmsman while the wide transom ensures easy access to the bathing platform which is available in two sizes, the larger of which closes the cockpit fully during sailing.